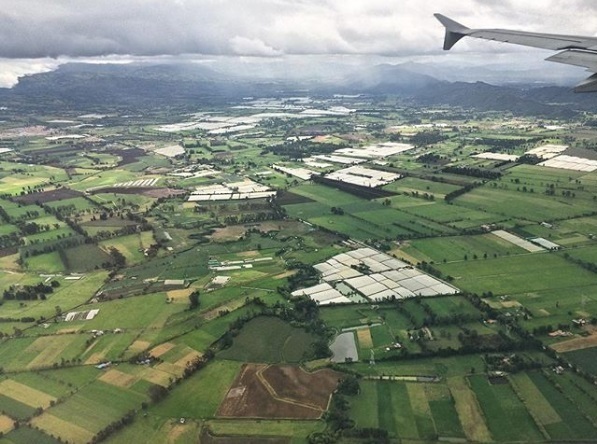 Landing in lush, green Bogotá. I’m a late bloomer. I remember throwing tantrums when my parents told me they’d be leaving my sister and I to spend the weekend at my grandma’s. Girl Scout sleepovers? I’d avoid them as much as possible and begin the countdown until I was back at home in my own bed. Even my first plane ride, a birthday trip to Disney World in Florida with my aunt and uncle, ended in tears and bitten nails as I called my Mom back in New York to tell her how “homesick” I was. You never would have pegged me for a traveler. It wasn’t until I got a boyfriend in Brooklyn, whom I’d visit during the weekend that I ever voluntarily spent nights away from home. As a high school freshman, for me, spending time outside of my parents’ gaze began to equate to new found freedom. During the hiatus over winter break from college senior year, I somehow convinced my parents to let me book a budget trip to Tampa (Miami was too expensive.) At 21, this was only my 2nd time on a plane, and at that point, taking a break from New York City meant a cure from boredom. Months later, after a day trip to Philadelphia with my college class, I convinced my then-boyfriend to return with me a few weeks later. Even so, I’d still never had a passport because I’d never left the country. This would change within the year. My college offered passport services and my mother encouraged me to apply for one to have “just in case.” At that point in time, traveling to a foreign country seemed like as much a possibility as going to the Moon. It wasn’t until my boyfriend’s mother came from Colombia to visit that I seriously considered leaving the country. I once became captivated by a book of photos taken in Colombia that I’d perused in a bookstore. Months later I’d find myself at JFK on an economy class Bogotá -bound Avianca flight. I’d be staying with my boyfriend’s family for two weeks in Bogotá , including a side trip to Medellín and its environs. Plaza Bolívar in Bogotá, the city’s essential photo op. Before any trip, I was usually already visualizing my return home. But this time was different. I surprised myself in the fact that my biggest concern was the fear of flying, which I’d only done a few times before. From photos and what Colombians had told me, Bogotá seemed grey with horrendous traffic, and bleak. Despite this, getting in the car to leave the airport might as well have been landing on another planet where everything was exciting and new. The humid, cool air immediately hit my skin and everything was so green. Political graffiti was juxtaposed with statues of Colombian heroes backed by mountains and colonial buildings. Was this really the city that everybody had told me was so cold and ugly? I wondered. 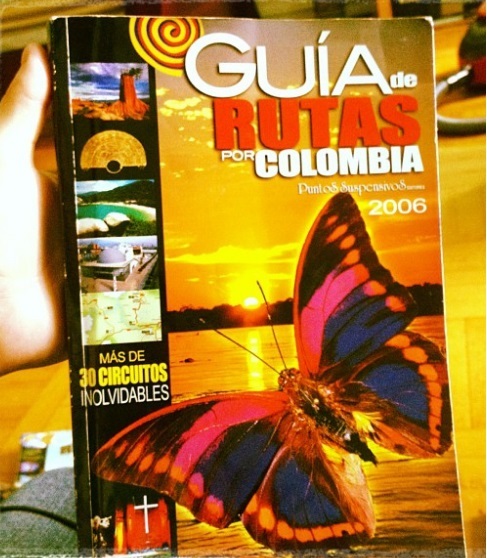 My trusty Guía de Rutas por Colombia. So many things to see and do, so little time. I still have a copy to this day. We were in the house for less than 36 hours before going back the airport once more for our flight to Medellín, where we’d stayed with cousins of my boyfriend’s mother. 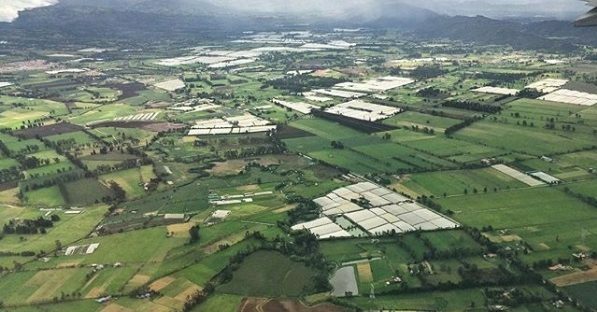 If Bogotá was April showers, Medellin was May flowers, with its air full of the sweet scent of earth and flora. The antioqueño countryside was the most beautiful place that exceeded any photo. 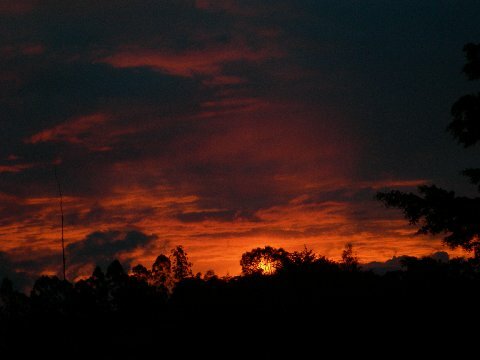 A gorgeous sunset in La Ceja, the country side. It’s hard to believe this is just 45 minutes from bustling Medellín. For a New York kid living in an overcrowded apartment, coffee fields as far as the eye could see and mountain roads lined with banana trees was overwhelming. I got to know the pueblitos outside of Medellin from the ceramics workshops of Carmen de Viboral to the vividly painted zócalos adorning the buildings of Guatapé, and of course, the 16th century churches of Santa Fe de Antioquia. The transition between bustling city and rural village was abrupt, which made Colombia even more appealing. The landscapes, the buildings, the smells, the food were spellbinding. Somehow I’d managed to live in the moment. It was all breathtaking; I didn’t want to go home. What if I could live here?, I thought. Maybe I could. In any case, I needed to return and soon. And just like that, my homesickness was gone. Colombia was just the right cure.